Today was just driving...we got a late start but had a very safe trip. When we arrived in Santa Fe we called Gabriel's Restaurant to check on the wait time and it was 1 1/2 hours, ouch. 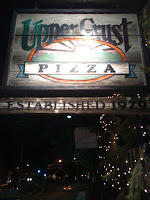 So, we thought we could grab a quick pizza at Upper Crust. It was packed there, too....our pizza took 45 minutes to arrive. The first night we are staying in Los Alamos (well, technically White Rock). I lived in White Rock for 6 years while my dad worked at the Los Alamos National Lab, I know, I know, this fact has been mentioned on numerous occasions on this blog. As usual, the lodging on this trip will be free courtesy of our American Express points. The stay in Los Alamos saves me some points. Tomorrow we go to the Taos area for several nights (and double the points), then back to Los Alamos before heading home. 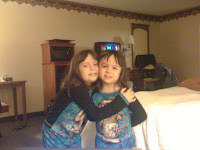 And, this does not include anything from our Upper Crust pizza dinner.....of course, when we arrived at the hotel they got their second wind and were literally bouncing off of the walls ! The girls are very excited about the snow. Dianna and I are excited, too. Be sure to check all of my links out in each post.